Goddard Lieberson created the studio cast album in the 1950s. He would gather a group of performers, an orchestra, a chorus and a conductor and create what sounded like an original Broadway cast album. (His 1951 PAL JOEY actually led to a Broadway revival using many of his cast members.) Lieberson’s challenge was to give the dramatic and theatrical feel of the best cast albums without there ever actually being a production to capture. This recording follows in that tradition. I’ve been curious about ALLEGRO for most of my years at R&H. It is considered a flop, but even the naysayers have always acknowledged that it was interesting. It came right in the middle of the great Rodgers & Hammerstein years, with their best shows lined up on either side, so it couldn’t have been that they had lost their talent. Something didn’t quite work, and I was fascinated to see if we could experience ALLEGRO in a form that would show what it was, so we could judge for ourselves, sixty years on, whether it deserves attention. The ball started rolling when conductor Larry Blank mentioned that he knew about first rate symphonic orchestras in Eastern Europe interested in recording projects. Since Rodgers acknowledged his debt to classical composers, something Robert Russell Bennett understood, and since this particular score has a broad musical scope, I figured an orchestra trained in the great romantic tradition would do justice to the music of ALLEGRO. The costs were reasonable and the time available was ample, so we decided to move forward. In the fall of 2006, several of us, including R&H Director of Music Bruce Pomahac, chief artistic guru of this recording, and Larry Blank, travelled to Bratislava and “laid down” orchestral tracks, from beginning to end. Larry conducted the orchestra while Bruce produced from the booth (through a translator, of course), while his assistant Wayne Blood and Bratislava coordinator Don Oliver listened for wrong notes, intonation, and phrasing. Once back in New York, we thought, “Now what?” Bruce and I began by thinking of who we could lure into the project to help us co-produce from that point on, someone well versed in the technical side of recording who would understand what we were trying to do. David Lai of Sony came to mind, and luckily it didn’t take long for him to sign on. Then we three sat down and talked about the cast. “Who,” we would ask ourselves, “would start to sing, and immediately the listener would think ‘grandmother’ or ‘leading man’?” That was the criteria we used, and after many spirited meetings, we made our wish list. Because we had no deadline, and were willing to wait for concert tours to be over, movies and television shows to finish filming, and opera engagements to include some breathing room, we got everyone on that list. (Thank you all.) And before our principals came into the studio, we brought on Dan Egan to assemble a chorus of first-rate theatrical-sounding singers, under the direction of Ben Whiteley, to handle the varied — and lengthy — choral and chorus parts of the score. Dan also led us to a group of children to sing the few key parts needed. Spearheaded by Bruce, we thought long and hard about the speaking roles, including the Greek chorus, the most innovative aspect of ALLEGRO. In addition to specific characters, some of the chorus lines in the original production were assigned to individual voices, while others were spoken by the chorus as a whole. We allowed ourselves to continue that notion, and asked some special people to participate, including my father Schuyler Chapin, Galen Guengerich, Senior Minister of All Souls Unitarian Church in New York City (to lead the wedding at the end of the first act), and Stephen Sondheim who was the Production Assistant on the original production. For the cameo roles, we thought about a wide variety of people whose voices would be believable as citizenry and characters of the world we were creating. (While listening to some CD transfers of Oscar Hammerstein’s Dictabelts, I came across portions of the television adaptation of ALLEGRO he was dictating for his secretary. We were able to pull a line out and make him part of the college sequence.) 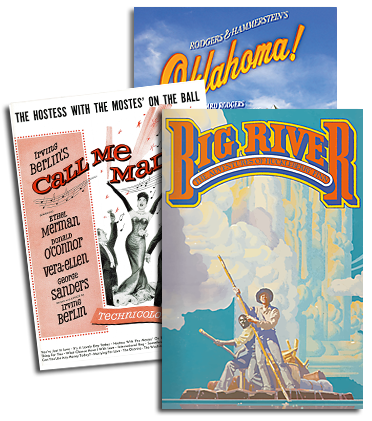 And we leaned on some of our colleagues here at the Rodgers & Hammerstein Organization—what theater office doesn’t boast some would-be performers?—to populate the rest of ALLEGRO. Today’s technological advances in recording make virtually anything possible. Gone are the days when you had to get everyone gathered in a studio at the same time. But having the ability to assemble the finished product like a puzzle doesn’t alter the challenge of a studio-only recording: it still needs to feel like a first-rate theater production whose score has been captured. That has been our mantra, and I stand in awe of Bruce, David, and our engineer Isaiah Abolin who have created from the patchwork pieces assembled over two years, a living and exciting recording that presents as complete an ALLEGRO as we could hope for.